Wow. I could not have asked for a more perfect day. It is one of those days that you could just relive over and over again without getting tired of it, which is a cliche and seems like it’s not true, but it really is to me. There’s nothing that quite rejuvenates you the same way an honest, loving and thrilling sense of connection does. It’s been nearly a month since the meetup occurred, and I still reminisce about how amazing it was to this day! In a nutshell, the connections and energies I’ve created and experienced this day were absolutely unreal. Ironically, I quietly thought that I wouldn’t have a good time at this meetup because I possibly wouldn’t be able to relate to all of these girls on a genuine level. But I was completely wrong–now I’ve even gotten together with some of the people I’ve met and have made friendships because of this meetup! So thank you so so much to Claire Michelle and Ashley Hampton for hosting this surreal event and uniting all of these beautiful ladies together so that we can all come together. Before I could eat breakfast, I parked around the Santa Monica Stairs and made sure that Cookie was sitting still on the passenger’s seat. 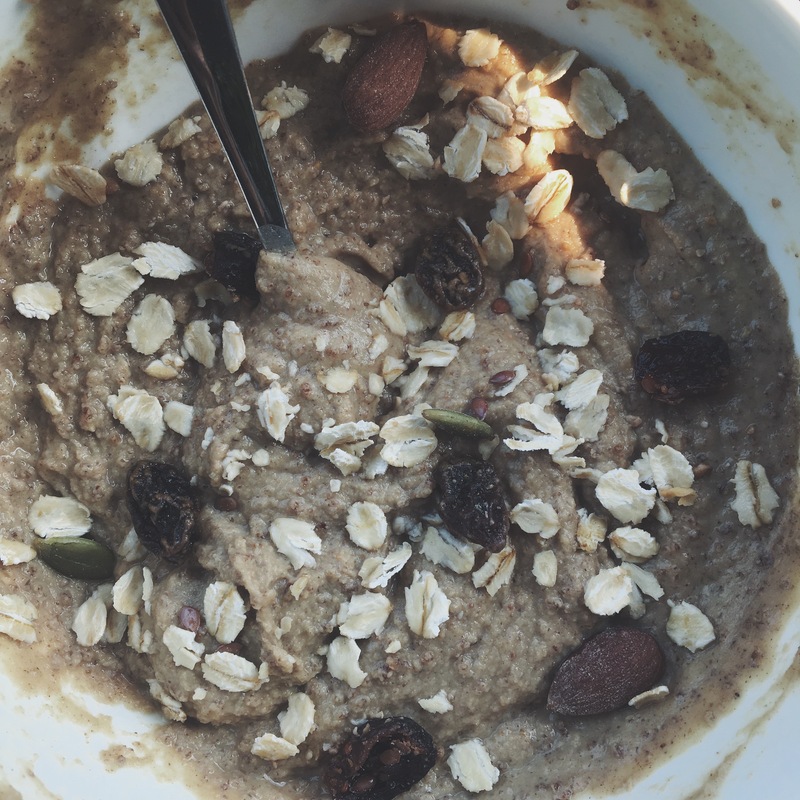 For a to-go morning meal, I made an almond peanut protein pudding made from two scoops of Garden of Life smooth almond butter protein, Tru-Nut powdered peanut butter, Stevia and water with Evoke Foods Morning Zen muesli. To be honest, I bought a bag of the Garden of Life almond butter protein and I was definitely disappointed with the result. It’s gritty, mild and has a very odd aftertaste to it. Even though I finished it all, I didn’t like it one bit, except it tasted much better with powdered peanut butter and Stevia mixed into it. This was probably my favorite meal with this protein powder, but I don’t recommend you purchase it despite its amazing macros and clean ingredients. After breakfast, Cookie and I decided to take a walk around the Santa Monica Stairs so I can check out the view and stretch out Cookie’s and my legs. I cannot begin to tell you how many dedicated people I saw running drills and working out near the stairs, and it almost stimulated me to do the same had I not been in inappropriate attire and brought the dog with me. Had to pass, but I was lucky to have run the stairs before! We got back to the stairs and I decided to re-park in a public parking building in order not to possibly be towed, which would have ruined the entire trip! It’s really annoying that the flat rates at Santa Monica are crazy expensive, which is why I don’t visit often and I only do so if I know I’ll be spending a great deal of time there. To pass time before the meetup, Cookie and I walked around 3rd Street Promenade to go window shopping. The security guards were kind enough to allow me to bring Cookie into the restrooms if I needed to, and I was able to refill my water bottle and get a bag to store my sweet potatoes instead of having to carry them in my teeny tiny black purse! Eventually, the time for the meetup was reached and Cookie and I headed towards the Palisades Park! When I arrived, Ashley was already sitting down at the benches with two girls named Laura and Jenna, who I ended up having lunch with at Cafe Gratitude a few weeks later! We introduced ourselves to each other and basically chatted about everything that I could never talk about with my family or school friends. The community just blossomed as more people arrived and brought delicious foods to munch on! I basically ate such an abundance of vegan food: sweet potatoes, banana cookies, donuts, peanut butter cookies, carrots with hummus, grapes, strawberries, carrot cake, and so much more! It was pretty much the BIGGEST lunch ever. I was shocked that I didn’t have that huge of a food baby once dinner arrived! Anyways, I absolutely loved every single bite I took, and I couldn’t help to share some food with Cookie as seen in the video! Don’t worry, she didn’t have that many treats! I ended up taking so many photos with Claire Michelle, Ashley Hampton, Mariah Sett, Mel, and a bunch of fellow vegan Instagrammers who were honestly the most beautiful, genuine and relatable girls I could ever meet! It was so easy for me to be welcomed in a conversation as well as starting up a whole new one that would grow into something so philosophical and so comforting. Throughout the entire meetup, I learned so many different backgrounds, situations, journeys and empowering stories of how these girls discovered veganism and touched others with what they’ve gained, as well as maintaining hope when people come to bash their ways of life. For dinner, we decided to grab food from Flower Child to go and eat by the parks to watch the sunset of the beach! 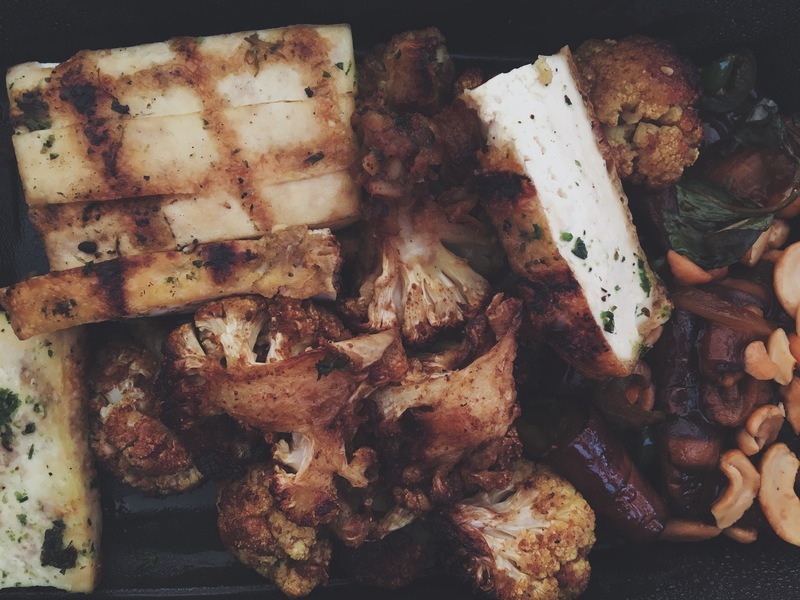 I ordered some curried cauliflower with miso eggplant, basil, cashews, carameized onions and organic tofu! The medley of flavors and spices were absolutely perfect while the vegetables were perfectly cooked. The crunch of the cashews and basil pretty much wrapped everything up on the best note! I will definitely order this again when I come back! In short, it was so nerve-racking to have made the decision to cancel my San Jose trip very close to its date, but it was ultimately one of the wisest decisions I’ve ever made. It really taught me how much I have to think for myself. It’s sad that I did have to miss out on an opportunity to explore a new place, but I knew that I could not miss the more promising opportunity to make new connections. The girls I’ve met today really inspired me to continue pursuing my dreams and letting go of small fears. Thanks to them, I’ve developed a whole new perspective on why people choose to do what they do, whether traveling away from home, not choosing university, and really having to embrace your own support when nobody else will provide the same support for you. If it wasn’t for staying home, I never would have partook in the fun that this day held for me! Strangely, it was almost as if it was meant to be as I was experiencing more and more signs that I needed to attend this event. I cannot thank everybody who came to this meetup enough. Thank you for contributing to such an incredibly momentous day. You are all truly amazing.